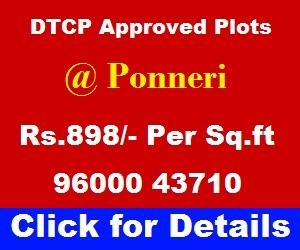 Is it safe to buy Panchayat Approved Plots, RISK in buying panchayat approved land, how to get DTCP Approval for Panchayat Approved Land. All questions answered here in this post. What are all the difficulties you’re going to face in future, if you already bought Panchayat Approved Plots. Even though Panchayat Approved Plots are easy to buy and price is also very low but there are some disadvantages in buying Panchayat Approved Plots. I’ve listed all the disadvantages of buying panchayat approved plots below. One of my customer asking this question. He is going to built a small house with his own income and not going for Bank Loan, whether it’s a right choice to go for cheaper Panchayat Approved Plots rather than go for a high-price DTCP Approved Plots? State Government promises to give basic amenities in DTCP Approved Layouts. It includes Thaar Roads, Drainage, Street Lights, Park, etc., it takes a lot of time for Panchayat Approved Layouts to get all these amenities mentioned above from the specific State Government. In Panchayat Approved Layouts – Roads are smaller in size, No Park, No Place for School, No Place for Community Hall, No Place for Temple, No Place for Mosque, No Place for Church, No Place for Children’s Play Area, there is no common place. So in panchayat approved layouts it is very difficult to get plan approval for building a Villa Type House or Multi-Story Building or even 2-floor building. Floor Space Index or Floor Area Ratio based on this only small building can be constructed and there is no place for constructing bigger house more than ONE FLOOR. In Panchayat Approved Layouts – It’s very hard to live because of space for living is limited. Ground Water is also Less, Air-Pollution, Traffic-Congestion and so on. If you want to convert Panchayat Approved Plots into DTCP Approved Plots then you have to pay Open Space Reservation Fees and get the Regularization Approval from the State Government. After you pay that Open Space Reservation Fees only you can get that eligibility to apply for the Plan Approval to build Two-Floor Building or more than that. So it is very clear at the first instance its look easy to buy Panchayat Approved Plots but later than you have to face all these expenses from your pocket. So it’s better you can go for DTCP Approved Plots in the first instance itself. In panchayat approved layouts you can’t build Commercial Building. State Government not give permission or approval to build commercial building in Panchayat Approved Layouts. The only option left for buyers who already bought Panchayat Approved Plots now immediately apply for regularization and get the approval so that you can get Bank Loan Facility, Get Plan Approved to Build your dream house without any difficulty. YES, You can buy Panchayat Approved Plots if it is available for reasonable price and another important thing whether that Plot Selling Company is ready to help you regularization of your plot according to the Tamilnadu Government Recent Announcement. It YES then you can immediately buy those plots. Regularization cost is only minimum amount say Rs.20 to Rs.50 maximum per sq.ft. If it is CMDA approved then you have to spend minimum of Rs.100 per sq.ft I mean it is only my assumption depending on the area it may vary. So consult with your register office before doing this and also consult with your selling company so that you can easily regularize your plot without any difficulties. Thank you. If you have any doubts please post it here in the comment section of your post.